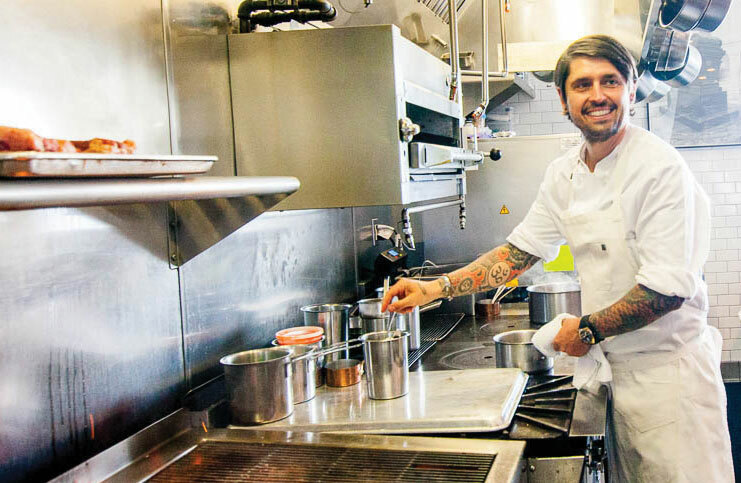 Chef Ludo Lefebvre behind the counter at Petit Trois. Photo by Capra Photography. Ludo Lefebvre has been named LA’s best chef and among the world’s top 50 and was knighted in France … but he still calls himself “a redneck from Burgundy.” After studying in master kitchens since the age of 14, he came to America 20 years ago, earning the prestigious Mobil five-star award at both Bastide and L’Orangerie (where he met his wife, Krissy). He then experimented with his now-legendary underground series of LudoBites dinners in spaces all over town—one-night affairs that pioneered the pop-up concept and taught Lefebvre that he could cook anywhere. So he did. He took fried chicken to the streets with the LudoBird food truck and to the masses at Staples Center. His magnum opus, the sublime Trois Mec, brazenly features five courses for $85 (plus tax and tip) in a dingy mini-mall. It has no menu, no sign and no phone; its 26 seats are sold online as tickets. Two more lauded mini-mall concepts are thriving—traditional French bistro Petit Trois and French-Mexican hybrid Trois Familia—with a second Petit Trois opening in Sherman Oaks by spring. What kind of a person takes so many unconventional risks, yet never fails to pull a “best new restaurant” out of his toque blanche? Find out in PBS’ The Mind of a Chef as it examines Lefebvre’s genius in eight episodes this season. You don’t explode like the strict chefs you studied under? Yes. Yes! Oooooh, yes! I’m a freak, actually. I want my kitchen to look the same every day. I want my knife to be in the same position. I want the onions to always be in the same place. I love discipline in the kitchen. That’s true at home, too, but when you have kids, it’s not your house anymore. I work all the time; I don’t go out. For fun, I sleep. I kiss. I do things with my wife and kids. Every Sunday we go to Studio City Farmers Market. My kids play in the entertainment area at the petting zoo and on the rides. Then we go home and cook. We always roast something for family dinner. Ice cream. I love ice cream, and my kids do too. We always go to McConnell’s in Studio City. And for the occasional thrill besides a sugar rush? Sometimes I surf in Malibu, and I love to ride motorcycles. I have two Ducatis that I drive to the forest or desert to go 160 miles an hour when there’s no one around. I love the speed, the adrenaline. I love the idea that I can kill myself with one mistake. It’s crazy, but chefs are crazy. Which other crazy LA. chefs are you most in sync with? My partners, Jon Shook and Vinny Dotolo, even though they are as American as I am French. They are the best guys I know. Really smart. I really love their restaurants. Animal is amazing, and Son of a Gun is the best, best, best fish restaurant in LA. Many people consider your fried chicken the best in L.A. What inspired you to tackle an American classic? When I first came here, I loved KFC. It was the first time I ate fried chicken. I’m passionate about fried chicken! When I was cooking LudoBites, I decided that I wanted to bring back fried chicken and loved the concept of a fried-chicken sandwich with coleslaw, pickles and a special sauce. Look now how many chefs are doing fried chicken. Everybody! Is that why you have a chicken tattoo? I don’t really have tattoos about food. I have the names of my wife and children. LA is on my chest. A snail, a chicken, a dragon, koi. I like Japanese-style tattoos done by artist Dan Sartor of Body Electric Tattoo. You’re also an artist, oui? I try to relate my paintings with my passion for food because I have a hard time expressing myself with just one plate. I love Jean-Michel Basquiat and the way he expresses himself. When an artist paints, it’s just you and the canvas. When you are a chef, many others are involved, so it’s frustrating. You teach them, teach them, teach them, but there are so many hands. I wish I could be a painter so no one else can touch it. What was your first impression of LA, 20 years ago? Everything was so big. The cars. The streets. And the lifestyle is good here: The sun, the beach and the palm trees are just like on Baywatch, which I watched in France because of the beautiful women. Where do you go in LA when you’re homesick for France? I go to Vintageweave, a store filled with things from France. Soap, dishes, linens, furniture. The owner is very passionate about France. It’s a magical place. And the truth is that I created Petit Trois because I missed home. It’s very French, very noisy, very tiny. Chefs are screaming, people are pushing you and waiters are rude to you, like in Paris. Except that Petit Trois and Trois Mec are in a not-so-Parisian mini-mall next to a gas station. It is ugly, but I love mini-malls because they are the culture of Los Angeles. I like the Trois Familia strip mall because it is so big! We have doughnuts! We have pizza! We have an amazing Cuban restaurant, El Cochinito, right next door! We have a dentist! Also, we have a store where you can buy everything for one dollar. And, listen, listen: We have a nail salon, so I get pedicures there. I love it. What are LA’s top French-food purveyors? The best food store I like here is The Cheese Store of Beverly Hills. They have the best French cheese. They also have the best baguette in town, made by Colleen DeLee, who also bakes them for Petit Trois. The best croissant in town is at Chaumont Bakery in Beverly Hills, because they use Le Beurre Bordier, the best butter in the world. Who makes the best french fries in town? Frites? Me! I fry my fries in clarified butter; nobody else does that in LA. So trust me, they are very crispy and very good. Everything is better fried in butter.